I like kale. A lot. It’s really more of a LOVE. You can do so much with it. We usually sauté it, but I also love it in slaw form. More recently I’ve been devouring it as Kale Bites (so good guys). ::random story alert:: When I was pregnant with the kiddo, I didn’t want to eat anything (it all made me nauseous). I would eat dinner and when I was done I’d tell my husband, “That was so good, really, but we can never eat that again.” The thought of eating that meal a second time made me feel gross (pregnancy is so weird). The only thing I could continuously eat and not feel like puking afterward was chicken, rice, and sautéed kale. That’s it. It was delicious to me. The rest of the food in this world made me want to vomit… for the entire pregnancy. SO. yes. Kale and I are friends. This year’s garden has provided us with a TON of the yummy curly green kale leaves since May. It’s wonderful growing our own food. I know where my veggies are coming from and my kiddo learns a bit about growing a garden. Another thing you will learn with a garden: how many damn bugs inhabit our plants! Yeah, I knew the slugs would eat the spinach and the squirrels will most likely eat all our strawberries. Yes. I knew this. 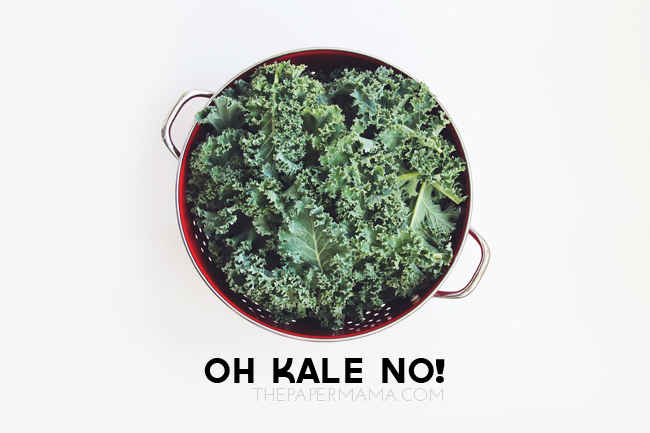 I had no idea how perfect kale is for each and every type of creepy crawly out there. It started out innocent enough. The sweet little kale seeds were sprouting out of the ground. -Damn, a slug got a couple.- Oh well. I’ll grow some more. -Ok, what’s this? There are little eggs on the back of half our leaves?- Wha? Dammit. Fine. Whatever. Moving on. Hmmm, just picking the kale and -WHAT THE fuh is, oh my gah ::throw leaf and jump up and down screeching::- There are 5 bagillion spiders chilling out on that single leaf. No. Maybe that was a one time thing? Sure. Why not. -Oh, look at that. The little curls in each leaf are perfect little homes for all the spiders- (I’ll just tell myself they are going to eat all the other bugs and spiders, they don’t bother me). -What the crap are those?- I now have to inspect the back of each leaf because apparently aphids find kale to be the most fantastic treat evar. In fact, they love it so much they’ve completely covered 1/2 the stalks of my plants. It’s pretty gross. Did you know they shed their skins and leave them for you to find and enjoy later? Yeah. More recently I’ve been finding the most adorable teeny tiny white furry caterpillars. With all these creatures lovin’ on my kale, a quick 10 minute harvest of kale turns into a 30 minute adventure. I do not want the “extra protein” from all these creatures living in my garden. SO, I pick and inspect each and every leaf. It’s time consuming, but worth it. All aphid infested leaves go straight to the chickens (they love it), the spider leaves go flying in the air while I flail my arms and make a high-pitched screech, and the pretty non-bug leaves go in the basket… off to dinner land. If you have a post you’d like to share today, please feel free to link it up below. And, feel free to link up to these blogs too… Parenting by Dummies, Project Alicia, Jenni from the Blog, In The Moment With, and Live and Love Outloud. I have a kale story from Mom's house… Adam pretty much saved the day. It involves spiders…. Will tell you later. That is hilarious. I can totally see myself doing the same arm flailing screech. I want to start a veggie garden, but I don't know if I can handle finding spiders and other bugs all over my plants! gah!